We were feeling really rotten as we left Cinque Terre behind, heading toward Piemonte on our month-long visit to Northern Italy, having picked up a nasty cold on the tour of Tuscany that would hang on for weeks—not good when your main pre-occupation is wine tasting. 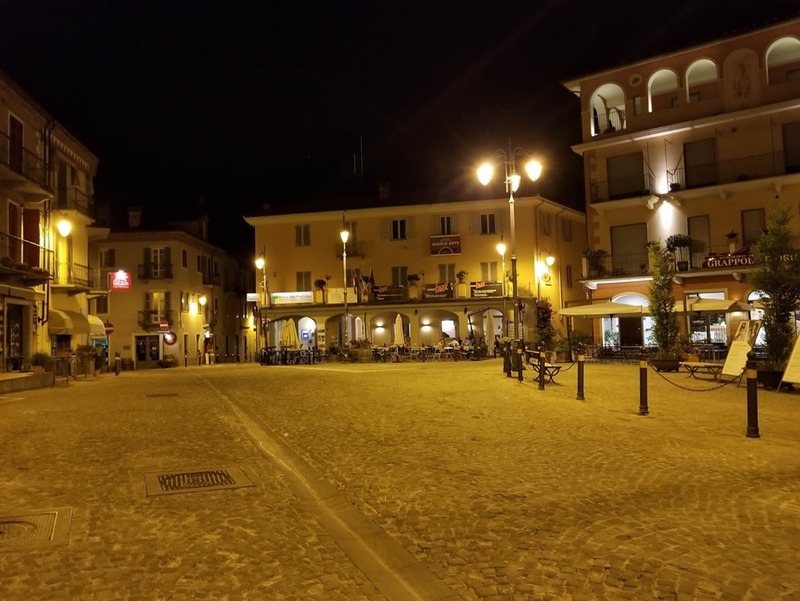 But with the help of some really effective cold medication and the aesthetic virtues of the Italian countryside our 10 days in Piemonte were not a total loss. 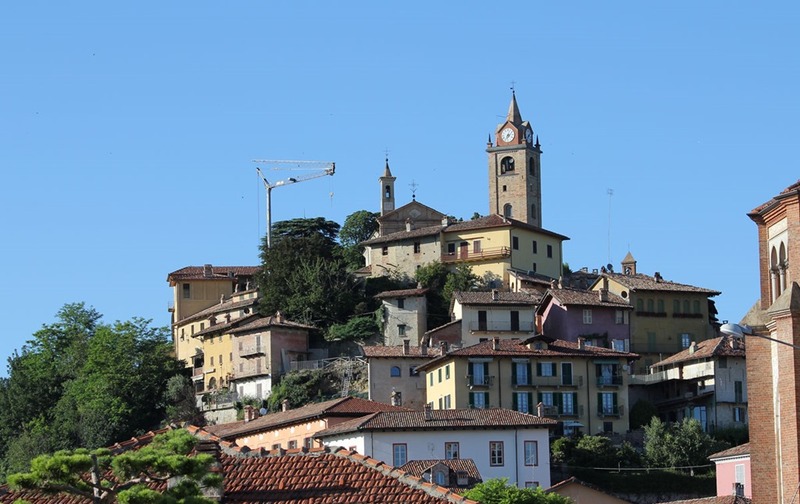 It is Piemonte that still has the feel of traditional Italian winemaking. 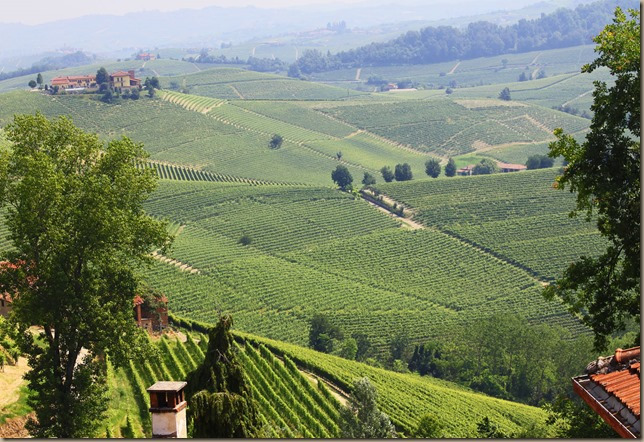 Since Piemonte is the home of Barolo, which some call the King of Wines, it is obviously a well-known wine region. However, the charms of the Nebbiolo grape can be hard for the novice to discern—it’s hard and aggressive when young, needs time in the cellar to acquire elegance and as a result it is expensive, especially in the U.S. For casual wine drinkers who want to do a little tasting in Italy, Piemonte isn’t on their radar yet—which is good for the rest of us seeking vestiges of the old world in the new. 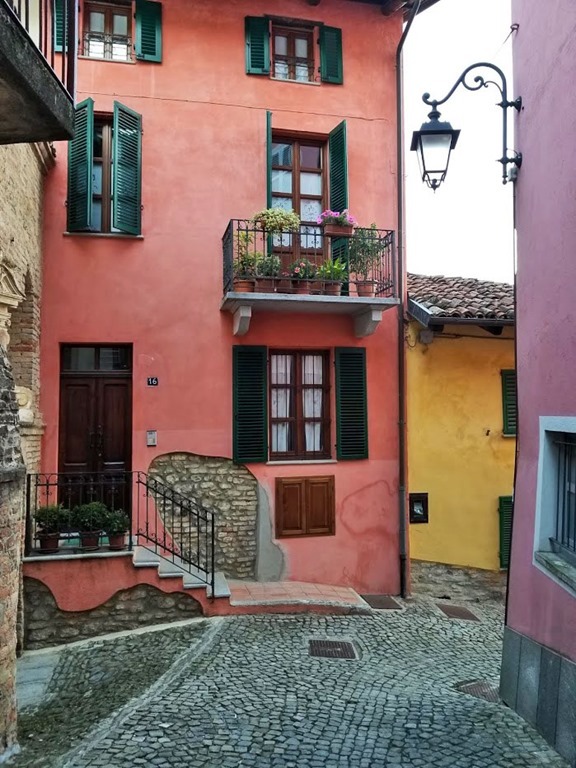 If you’re seeking rustic charm, a bit of authentic tradition, with great wine and food, the wine villages of Piemonte are a bit off the tourist track, although they are certainly open for business and will no doubt soon be discovered by the hordes. 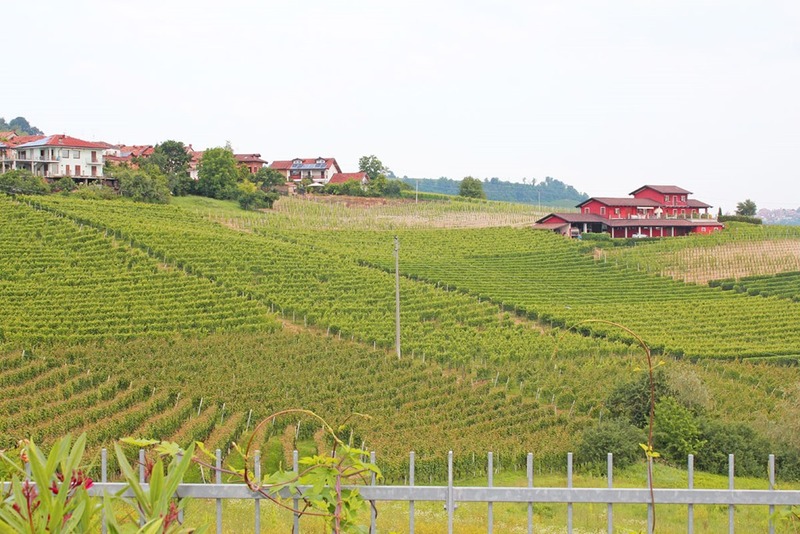 The wine region of Barolo, anchored by the village of the same name, is divided into 11 communes although the best known are La Morra and Serralunga. La Morra produces a softer, more elegant style of wine. Serralunga is noted for its power. There are about 90 wine grape growers in La Morra with very few big companies. The average holding is about 2 hectares (5 acres) per owner, which limits, to some degree, the ability of large companies to buy up land. Vineyard land put up for sale by law has to be offered to the neighbors first but they can’t always afford it and there is some foreign investment starting to play a larger role here. And there is little plantable land left—the cost of vineyard land is over 1 million euros per hectare compared to under 1000 euros per hectare when the wine boom started in the 1980’s. As in most traditional wine regions in Europe, quality is tightly regulated. In order to make Barolo, the vines must be a least 5 yrs. old. Grapes from the younger vines go in the Langhe Nebbiolo. Yields can be no more than about 7500 bottles per hectare (or about 3000 bottles per acre), have at least two years aging in oak and at least one year aging in the bottle prior to release. For wines labeled Barolo Riserva, five years of total aging is required with at least three of those years in oak. And there is a modernist vs. traditionalist debate in Barolo. The modernist style uses less skin contact to make the wine softer and ages the wine in smaller barrels to impart more oak flavor and encourage oxygen uptake. They also employ sophisticated canopy management techniques to get riper tannins. But of course “traditional” is relative. Prior to the modern era, traditional Barolo would have been sweet, only about 9% alcohol and slightly fizzy. And traditional Barolo had a reputation for being funky, swarming with VA and brett. Even the traditionalists have cleaned up their act considerably. Our first stop was Aurelio Settimo, a traditional producer in La Morra, who began making wine for sale in 1962. Their property is the site of the celebrated vineyard Rocche dell’Annunziata, long one of La Morra’s best crus. For their Barolo they use lots of skin contact—3 weeks maceration before pressing. The fermentation happens in glass-lined concrete tanks to keep temperatures stable, and the wine remains in concrete for one year before aging for 2 years in large, 3000 liter, oak barrels. The concrete tanks were built in 1962—no modern, stainless steel, temperature controlled tanks for these guys. Their oak barrels are used for 20-25 years. This is really old school winemaking. The wines were impressive. 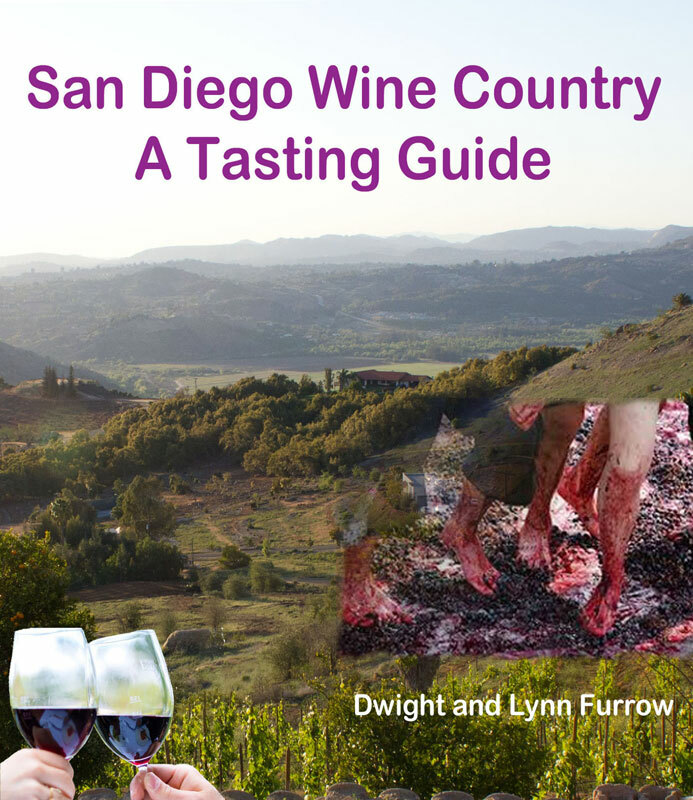 We tasted through an extensive lineup including their less expensive offerings. Dolcetto d’Alba is the everyday table wine—this one was fruity, almost Beaujolais-like but with an earthy background. The 2013 Langhe Nebbiolo using grapes from younger vines spent 2 weeks on the skins and 40 months aging in concrete with no oak. This is the only producer that leaves their Langhe Nebbiolo in concrete for 3 years and that commitment to quality is evident in the glass. This wine had beautiful floral notes with lots of racy minerality. Langhe Nebbiolo lacks the power and depth of Barolo but they almost always offer good value and can be purchased at the winery for under 20 euros. As for the Barolo, the 2011 Classico was firm but elegant with lots of minerality and a sweet raisin quality. The Rocche Barolo from their Rocche Anunziatta vineyard gets southwest exposure and features a fuller midpalate, and hints of truffle, more complexity and grippier tannins. And finally they opened a Classico 2006 for us to try. Very earthy and expressive, developing elegance but still quite tannic. They export about 70% of their 40,000 bottle annual production which is good for us. After lunch with the cheesemaker (more on that next week) we visited one of Seralunga’s premier producers, Paolo Manzone. This is an ancient property for whom Paolo was a consulting winemaker until 1999 when he launched his own label using fruit from these vineyards. These wines are more modern in style. Before getting to the Barolo, the Arneis, the traditional white grape here, was lovely as was the Barbera d’Alba which sees a year in 350 liter French oak barrels and was quite expressive. The Luvi Rosso, a rare blend of Nebbiolo, Barbera and Dolcetto was an approachable wine suitable for young release. Blending Nebbiolo to soften the wine is becoming more common here following the lead of the super Tuscan blends. The two Barolos we tasted from 2014, the Commune di Seralunga from 25 yr. old vines and the Meriame from 75 year old vines were extraordinary—both had explosive aromas and were elegant and polished on the palate despite their youth. As expected the Serralunga from the old vines was more concentrated and powerful. They see 26 months in wood, a mix of large barrels and smaller 350 liter barrel both old and new. So which do I like best, the traditional or the modern? No need to choose. I loved the earthy expression of Aurelio Settimo’s more traditional style but the combination of power and elegance from Paolo Manzone were equally impressive. Throughout our 10 days in Piemonte we tried several more Barolos and a few Barbarescos, from the neighboring Nebbiolo region, as well. I must say the Barbaresco’s were ordinary although I didn’t seek out the best producers. But the star, the Barolo that left a lasting memory I found in a restaurant in the village of Barolo. 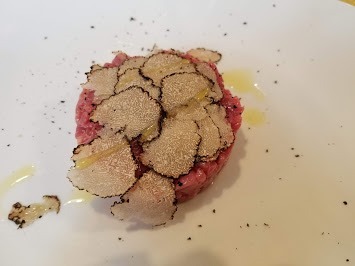 The Bersano Riserva 2010 has such pronounced truffle aromas it paired perfectly with this crudo with shaved truffles, and with Barolo it never hurts to have a bit of age on the wine. The food of Piemonte is as compelling as the wine but this post is already too long. I’ll cover the food next week. Cross-posted on Edible Arts on 8/30/2018.